30 Jan 2018, Osaka, Japan – Panasonic Corporation announced the successful completion of its 100 Thousand Solar Lanterns Project, which has brought light to off-grid communities in 30 countries through 131 non-profit and other organizations in the last five years. Since the project’s inception in February 2013, a total of 102,716 solar lanterns have been donated, including 5,004 lanterns given today to Indonesia, which has marked the end of the project. The project was part of Panasonic’s Corporate Social Responsibility (CSR) initiatives that make use of its technologies and products in line with the company’s management philosophy since its founding in 1918, that is, to make a contribution to the progress and development of society and the well-being of people through its business activities. There are estimated 1.1 billion people who live without electricity in emerging and developing countries. Panasonic’s project got started with the aim to help solve social issues stemming from a lack of light in the fields of medicine, education and economy, among others. 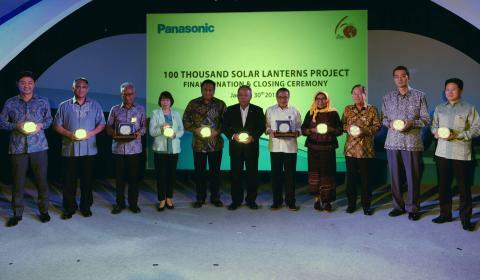 Panasonic has strived towards the goal of donating a total of 100,000 units of solar lanterns by 2018, its centenary year. Panasonic’s lanterns, which were brought to communities in cooperation with non-profit, non-governmental and other international organizations, helped alleviate problems and brought about improvements in such areas as education, health and medicine, and women’s independence. The solar lanterns have also contributed to the Sustainable Development Goals (SDGs) set by the United Nations to mobilize global efforts to end poverty, protect the planet and ensure prosperity. With the completion of the 100 Thousand Solar Lanterns Project, Panasonic now carries on its efforts to deliver more light to people in regions without access to electricity in a new framework. In Japan, Panasonic employees took part in the project through its employee benefit program. In addition to this, to expand the activity beyond the company, Panasonic will begin utilizing crowdfunding this April to enable anyone who shares the spirit of this campaign to participate by pledging a small amount of money . Ms. Rika Fukuda, General Manager, CSR & Citizenship Group of Panasonic, which led the project, said: “We are very pleased to achieve the 100,000 goal. As a global corporate citizen, we remain committed to helping people living without electricity solve problems, with the aim to build an inclusive society where everyone enjoys life by sharing the joy with each other.” The company will also continue contributing to SDGs through activities that utilize its business, she added. Sustainable Development Goals are a set of goals adopted by countries at a special United Nations summit in September 2015 for the period from 2016 to 2030. The SDGs comprise of 17 goals and 169 targets aimed at realizing sustainability, and it is the UN’s intention that no one should be left behind. The SDGs are universal, and require the combined effort from all nations, developing and advanced.